The present pier was built in 1760. It was used by small vessels and ferries to Leith and Newhaven. Frequently dignitaries of Church and State crossed over here on their way to St. Andrews. The old capstan which is dated 1813 and was used to pull the vessels alongside still occupies its place on the pier head. Also still visible on the pier are the steps servicing the ferry and the ramp used for carriages and animals. One of the problems affecting the boats was the steady accumulation of sand beside the pier which made the approach difficult. One solution to this was to call out some of the townspeople from time to time, but this was neither popular nor satisfactory. Eventually an engineer friend of the local MP, Sir John Hope, devised a plan. On the site of the present car park by the harbour, a deep sump was dug. At high tide, water entered through the sluice which was then closed. The gate was beside the steps leading down to the sands. There are seventeen steps in all but now only a few are visible. At low tide the sluice gate was opened and the water rushed down the paved way beside the pier, clearing the sand as it went. The sump was filled in during September 1937. In 1989 space was needed for new settling tanks for the new sewage system in the Pettycur area so the sump was cleared out to contain the tanks, then refilled to form the car park. Even with this sand clearance, the commercial days of Pettycur were numbered. In 1842 the Duke of Buccleuch, whose company had completed a deep water pier at Granton in 1838, now had a similar pier built at Burntisland and the stage coach route was changed to the new terminal. As part of the Duke of Buccleuch's agreement, a proper road was built between Kinghorn and Burntisland. 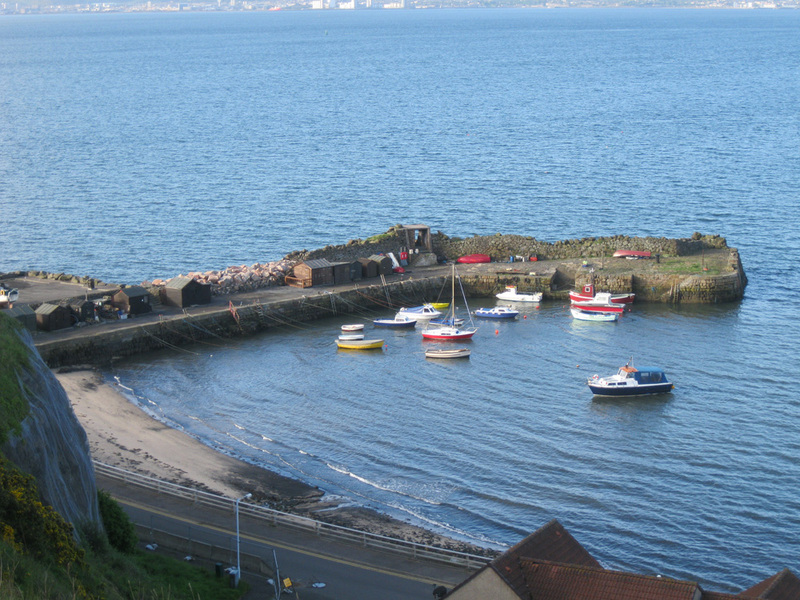 Kinghorn's strategic position on the Firth of Forth has been its strength for hundreds of years. During World War II, Pettycur played an important part in the defence of the Forth. On the pier are the remains of a searchlight post, and the cliffs to the north of the Bay housed an army camp of 600 to 800 soldiers (mainly Polish) of which few signs remain. Pettycur House (formerly Pettycur Inn used by ferry passengers) was used during the War for billeting soldiers before being converted into flats by the Town Council in 1950. Odin Villa is built on a former searchlight post. Further up Pettycur Road can be seen walls topped with broken glass which mark the site of barracks and gun emplacements. On the north side of Pettycur Bay, now the site of a housing scheme, there was a saltworks using sea water and coke ovens. This lasted from 1870 until 1894. A small bottle making plant was set up in the derelict works in 1901 but failed after a year. The works was re-opened in 1908 by the Kinghorn Bottle Company, which became part of United Glass, mainly producing whisky bottles. The factory closed in 1982. On the cliffs above this site can be seen railings, marking the bounds of the cemetery created in 1875. An iron ring set in the rock can be seen below these railings. This is known as the Witches Ring. Witches from Burntisland and Kinghorn were burned on the hill above, after being chained to the ring in the cliff. If a witch was dealt with leniently, she was only partly burned then tossed over the cliff still attached by a chain to the ring, thereby giving a quick end to her suffering. The last witch to be burned at Kinghorn was Katherine Wallenge on 24th March 1644. A short distance to the east of this point lies the Crying Hill, previously known as the King's Castle Hill - called the Crying Hill during the days of Pettycur ferry trade. A 'cry', or call, was sent from this vantage point to warn boatmen of the tidal conditions and inform waiting passengers of the arrival of ferries and stagecoaches. The 'cry' gave way in time to a system of bunting signalling. The railway line can be seen to the west of these cliffs. This line was constructed between 1846 and 1847 as part of the Edinburgh and Northern Railway. A spur line was built from Pettycur harbour to Sandhills, initially to transport engines and wagons made in Newcastle and transported by sea to Pettycur. This line was used later to carry away sand from Pettycur beach for the construction of Rosyth Naval Dockyard. It was also used to deliver materials to the bottleworks when that was in operation. The spur line has a very steep gradient and its construction virtually blocked off a famous healing spring, now reduced to a trickle which can be seen in the rocks about four metres from the sand level. The pier at Pettycur is its 'crowning glory' and is Grade 'A' listed as an important monument. Poor workmanship on the car park site and recent storms mean that the pier is in danger of being lost forever, unless money can be found to protect the area. Today, it is a haven for small fishing boats, the pier walls littered with lobster creels and crab claws.